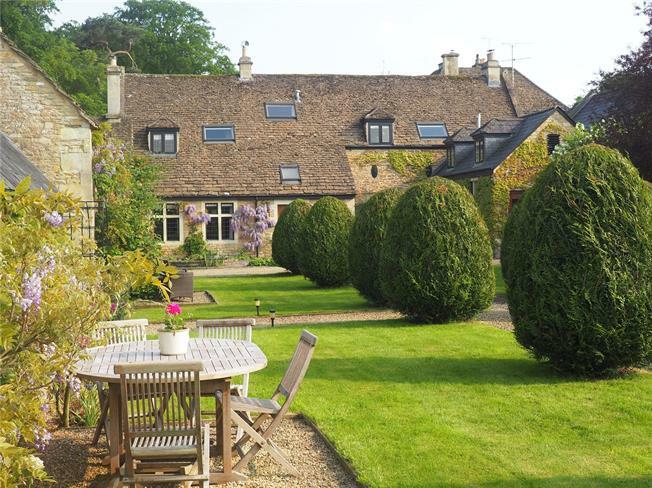 5 Bedroom Detached House For Sale in Wiltshire for Guide Price £1,350,000. Shaw Court is a superb and unique country house approached via a tree lined avenue which leads to three beautiful homes, Shaw Court benefits from the accommodation facing towards its own private walled garden and adjacent field. An attractive terrace leads to the front reception hall flanked by the drawing room wing and the kitchen wing. The drawing room is well proportioned with a central Bath stone fireplace and open fire. Off of this room is a further reception room, currently used as a formal dining room, but would be a super snug or play room. The kitchen is of particular merit, a spacious room with tall beamed ceilings and over 30ft long. A handmade kitchen has been designed to create the perfect U-shape and includes a four oven Aga. There is a large dining area with an impressive fireplace with a wood burning stove and adjacent is the family sitting room. The versatile accommodation will suit many families. The five bedrooms all with private bathrooms are located on the first floor in separate wings. The master bedroom suite is a stunning room with exposed A-frame beamed ceiling plus a pretty fireplace, it benefits from a dressing room and private bathroom. Also in this wing is the second bedroom suite, plus the third bedroom can be accessed from here or can be a self-contained suite with a private ground floor entrance, with sitting room and shower room with stairs leading up to the bedroom. There are two further suites above the family room and off the kitchen wing.